I really really hate confuse! This dungeon is filled with confuse casting round pink puff balls of doom. The pink confuse guys are always found with the other monsters which hit pretty hard. When confused you have to be careful that you don't go careening off into the arms of one of their friends. 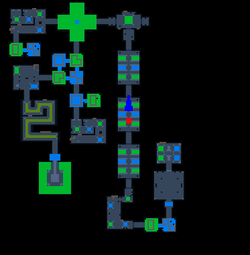 Once you learn how to switch your keyboard controls when you are confused you are good to go ... but, in this dungeon the confuse only lasts for a couple of seconds which makes it harder because by the time you have mentally and physically switched controls you are back to normal controls. If possible, when I see these pretty pink balls of cheer, I kill them. This dungeon is really two into one. The first area is the boss Dr. Terrible, just get to him and do him in. The second area is the Horrific Creation which is accessed via the main boss room after all the white coils are destroyed. Don't miss a coil or you will have to go back and find it. My rushing gripe: I dislike the idea of rushing this dungeon. If you rush, then you are not planing to do the Horrific Creation. If I see someone rushing I just wait until he gets to the boss, then I teleport to him, finish the boss and leave. I absolutely will not go back and clear the coils, if you are the rusher you should not expect anyone to go back and clear the coils either. Why rush, if you are good enough to rush, then consider instead clearing the coils. As a group we can clear the white coils at a very fast rate. You don't need to clear the monsters just the coils. Horrific Creation - Killing this guys is pretty easy but can be tedious. Move into the room get behind a green pool. The Horrific Creation can only be hurt when it turns into a giant pet. He will chase you so move into the pool (you change to a pet) as he follows. The blue pools will change you back to normal. Remember that your ability will still work when you are a pet but you can not fire your weapon. When the Horrific Creation flashes white he will go and shoot about 16 large orange shots at you. Stand in the green pool (you change to a pet) dodging the shots. As the last shot is fired make a quick brief move toward the Horrific Creation then back as far as you can into the green pool. The Horrific Creation will be lured by this move and follow you in. As he gets into the pool he changes to a pet allowing you to hurt him, you must avoid him and rush to a blue pool to change back. You will attack while he is a pet after a short time he will revert back. You will have to repeat this several times. This dungeon is hard for the unpotted. If you are in a group then you can help clean up the monsters that are missed. If you are solo, consider taking a pass. A solo Rogue or Mystic will have a chance but it will be be a long haul. A maxed DEF character has an easier time of it. He can take a few extra hits and move on. You can rush if you want whether clearing the coils or going straight for the boss. Warrior - A 4/8 warrior can kill anything here with ease, or move past it taking little damage. Warrior with Juggernaught - Tank and Kill, nuff said. Knight - Stun is amazing, drop the big red Crusher Abominations and help the group move along. When at the boss chain stun in 3 or 4 count intervals. Wizard - Spell bomb is a great equalizer, kills and clears everything. Rogue - Man I love this guy if you are solo. You can cloak your way through the monsters clearing the coils as you go. Time your cloaks for safety, move to a safe area when your cloak runs out. Once at the boss just beat on him until dead using your cloak to your supreme advantage. Don't cloak at the Horrific Creation as it will slow everything down. Assassin - He is great at clearing the monsters as you make your way to the boss chuck your poison and follow through with a knife to the gut. Mystic - Wow, this guys is fantastic. Use your longest duration Orb and stasis the monsters while clearing the white coils. Or, use curse and clear everything faster. The Mystic in a group will be loved. Priest with Tome of Purification / Book of GEB- Using your Puri on the way to the boss, removing the confuse as you go. When fighting the Horrific Creation you can stand in the green pool as the lure, move out of the pool and use your tome to remove your PET affects. Saves you from running to the blue pool to change back. Class with St. Abraham's Wand - If you are solo, creep into the first boss room while shooting at the boss icon. Move a little bit at a time until you hear your shots hitting the boss. Stay there until the boss is dead, this makes doing the 1st boss very easy and safe and .... faster than moving in and chasing him around. Archer - Once at Dr. Terrible, use your paralyze and keep him pinned for a quick finish. When at the Horrific Creation use your Paralyze ability again to keep it in the green pool as long as possible. With timed paralyze shots and refilling your mana with your MP pots you can keep it in the pool until it dies. Huntress with Coral Venom Trap - When you get to Dr. Terrible, use your Ctrap and stick him to a spot, finish him off easy. When at the Horrific Creation use your Ctrap (Paralyze) to keep it in the green pool as long as possible. With timed paralyze shots and refilling your mana with your MP pots you may be able to keep it in the pool until it dies. Pet with Electric/Paralyze - While not a class, this pet if properly placed in the pool can keep the Horrific Creation in the green pool while you kill it.